At the beginning, Bilbo Baggins (Martin Freeman) and the band of Dwarves watch the dragon Smaug (voiced by Benedict Cumberbatch) demolishing Laketown from the Lonely Mountain. Bard (Luke Evans) then manages to flee from prison and kill the beast. He is subsequently chosen as the new chief of the city’s population and decides that they should seek shelter in the Dale ruins. At Erebor, Bilbo and the rest of the Dwarves find out that their leader Thorin Oakenshield (Richard Armitage) now suffers from Smaug’s ‘dragon sickness.’ Bilbo then hides the Arkenstone from him so as not to further increase his madness, causing Thorin to order the fortress to be sealed. Galadriel (Cate Blanchett) liberates the wizard Gandalf (Ian McKellen) and lifts Dol Guldur’s spell of concealment. The evil lord Sauron and his nine Ringwraiths reveal themselves, but the two are able to fight them off with the help of Elrond (Hugo Weaving) and Saruman (Christopher Lee). Gandalf heads for Erebor to warn the Dwarves of the Orc army approaching, while Orc leader Azog sends his acolyte Bolg to Mount Gundabad to summon their second army. The Elves Legolas (Orlando Bloom) and Tauriel (Evangeline Lilly) watch these Orcs being joined by giant bats and Goblins. An Elf army commanded by Thranduil (Lee Pace) arrives at Dale and forges an alliance with Bard and his humans against the stubborn Thorin. Bilbo sneaks out of Erebor to hand over the Arkenstone to Bard and Thranduil in order to make Thorin negotiate with them and is almost killed by the Dwarves’ leader for his betrayal. Another army arrives, Dwarves led by Thorin’s cousin Dáin (Billy Connolly), and prepare to attack the humans and Elves. When Azog appears, however, all other parties soon turn their attention to their powerful common enemy – the Orcs. The first thing that sticks out about The Hobbit: The Battle Of The Five Armies is its running time. Clocking it at 144 minutes, it’s almost a short film in Peter Jackson’s body of work. That’s a good thing, for the pacing of the sequences and the overall picture is much better and more harmonious than in either of the first two movies, which certainly had their lengths. There are hardly any boring moments in The Battle Of The Five Armies because it’s as kinetic as it gets. For those who have been a bit turned off by the drawn-out conversations of the other two films, it’s two-plus hours of less talk, more action. In a way, The Battle Of The Five Armies also serves as a metaphorical comment on the current events and realities around us. As we witness the world we live in slowly sinking into chaos, so Middle-earth seems to be falling apart by the minute in the course of the movie, only for the good to emerge victorious when all is said and done. There might therefore still be a glimmer of hope left for all of us, even during a state of pandemonium. Peter Jackson’s Tolkien adaptations have always been about the value of true friendship in a world of mayhem, and when he finally awakes from his dragon-inflicted madness, Thorin also realizes that Bilbo never intended to betray but help him. Speaking of Baggins, the eponymous hero of The Hobbit is reduced to a mere supporting character. His role is really diminished compared to the first two movies, to the point of wondering why The Battle Of The Five Armies is even billed under The Hobbit anymore. Each of Peter Jackson’s first five Middle-earth films came with an impressive array of dramatis personae, but at least The Lord Of The Rings never emphasized one of them in the title. Making Bilbo but a footnote of The Battle Of The Five Armies again reflects negatively on the director’s decision to stretch The Hobbit to three movies. Another problematic aspect is that sometimes the humor Peter Jackson intended to include doesn’t really work too well, particularly in the final fight. It sometimes even borders on being ridiculous, such as when Bilbo throws pebbles at approaching Orcs and kills them with these actions. The combat between Legolas and Bolg on the bridge is another case in point. What you get is basically The Lord Of The Rings meets The Matrix, for Orlando Bloom’s Legolas is one of the chief characters from Jackson’s earlier trilogy and the slow-motion from that sequence is a trademark of the Wachowskis’ cult cyberpunk movies. You could also discuss the Tauriel/Kili love angle, but that reeks like one of the manifold concessions a director has to make in order to sell such a high-profile project to the major Hollywood studios. 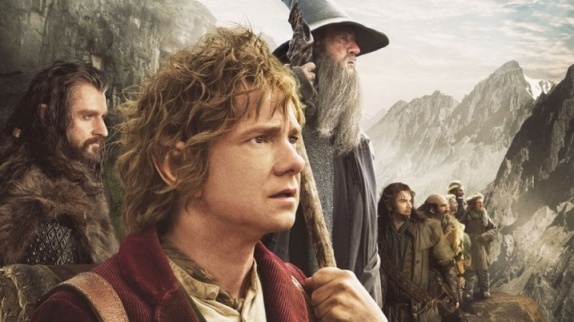 In essence, you can compare The Hobbit to the second Star Wars trilogy, Episode I to III. Both have a slow, rather disappointing start but gradually become better over the course of the three movies without ever rivaling the greatness of the preceding tripartite series. With the final part of Peter Jackson’s The Hobbit now in the books, Tolkien’s cinematic run seems to have come to a close. His estate refuses to give permission for other theatrical adaptations, such as of The Silmarillion. Teutonic metallers Blind Guardian, however, offer a decent sonic alternative with their Night-fall In Middle-Earth album (and several other cuts). Seen at Cineplex, Limburg an der Lahn, Germany, on 22 December, 2014.